BELMOPAN, Cayo, Tues. Mar. 28, 2017–At a special Senate sitting held at the National Assembly in Belmopan on Monday, March 27, 2017, to debate the national budget for the upcoming fiscal year 2017/2018, the recent renegotiation of the billion-dollar superbond featured highly in the debate, as well as the cost of nationalization of two utility companies —the Belize Telemedia Limited and the Belize Electricity Limited (BEL). The discussions ensued as Senators considered 5 motions and 11 bills, which were all passed in Monday’s sitting. Notably, the Protected Areas Conservation Trust (Amendment) Bill, 2017, which involves the raising of departure taxes for foreigners traveling to Belize by air – firmly opposed by the Belize Tourism Industry Association (BTIA)—is being held back. Senator Osmany Salas, representing the NGO community, called for a division, and while the 6 Senators from the Government side voted for it, the other 7 voted against it. The motions passed are: the Sale of Government Shares in Belize Electricity Limited Motion, 2017, for the sale of 3 million shares in BEL at $5 each to the Belize Social Security Board; the Establishment of the National Assembly Staff Committee Motion, 2017; Fiscal Policy, Budget Proposals and Fiscal Strategy Statement and Reports Motion, 2017; Official Charities Fund Motion, 2017; and the Government of Belize – Amendment to Terms and Conditions of the GOB U.S. Dollar Bonds due 2038 Motion, 2017. The 11 bills passed were the General Revenue Appropriation (2017/2018) Bill, 2017, which enshrines the new budget; the Central Bank of Belize (Amendment) Bill, 2017, for additional borrowing on the domestic market through the issuance of treasury notes and bonds; Customs and Excise Duties (Amendment) Bill, 2017; Stamp Duties (Amendment) Bill, 2017; General Sales Tax (Amendment) Bill, 2017; Environmental Tax (Amendment) Bill, 2017 – to raise a further $80 million in tax revenues; the Statutory Bodies (Development Contribution) Bill, 2017 – to mandate selected statutory bodies to pay 10% of their revenues to Central Government; as well as the Criminal Code (Amendment) Bill, 2017; the Evidence (Amendment) Bill, 2017; the Indictable Procedure (Amendment) Bill, 2017; and the Parole Bill, 2017 – to enable reforms in the criminal justice system, including the inclusion of murder convicts among those that can now be considered for parole. Whereas Prime Minister and Minister of Finance Dean Barrow said at the close of the House debate Friday night that the nationalization of Belize Telemedia Limited (BTL) will more than pay for itself, Senator Mark Lizarraga, representative of the business community, said that it is worrisome to see that the Government has invested $557 million and counting in Belize Telemedia Limited and over $100 million in the Belize Electricity Limited, “and if we look at the budget book, page 21… of the estimates, we will see that where last year it was projected that BTL will have returns through dividends of $10 million… this year, we are seeing that both investments in BTL and BEL will only be yielding $10 million. That warrants some serious explanation,” he went on to say. Lizarraga asked: “…where is the return on our investment?” He said that if the Government is realizing $10 million now, after having invested close to $700 million, we will never ever finish paying for these utilities. 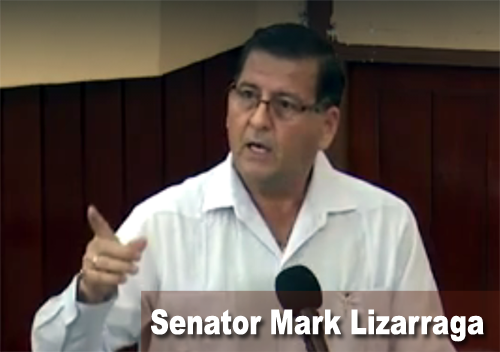 Tabled at Monday’s sitting of the Senate was a motion to support the restructuring of Belize’s billion-dollar superbond. 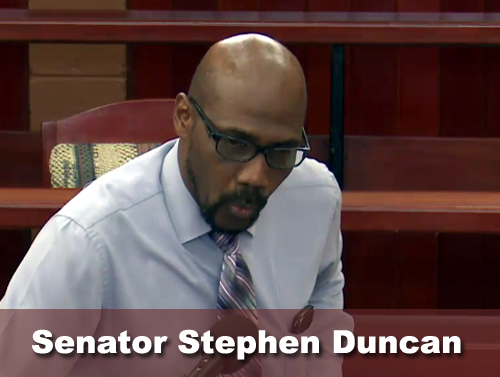 UDP Senator Stephen Duncan supported the renegotiation, saying that if this renegotiation helps us to work towards generating a surplus in the budget, it is good because it helps us with fiscal discipline. Senator Valerie Woods, member for the People’s United Party (PUP) Opposition, said that with delaying the repayment of the principal from 2019 to 2030, the government has kicked the can down the road, but she asked what would be done during those 13 years to address the problem. “There were 9 such years that we had where we were supposed to be producing surpluses that would not have allowed us to kick this can down the road. What program would be so materially different this time around?” she questioned. 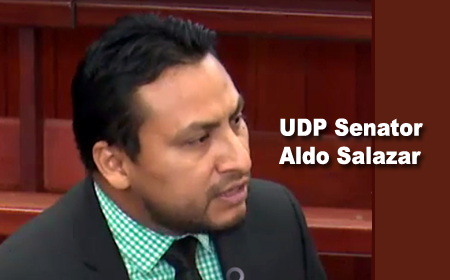 UDP Senator Aldo Salazar retorted, in his presentation that, “…we are dealing with the can that they kicked down the road.” He claimed that there were savings in the last two restructurings done by the ruling party: $236 million in the first renegotiation and $170 million in the second. The principal will be repaid in what the Government has described as “5 soft bullet payments,” but Woods disputed that characterization, saying that the bullets will be “hard” and “…coming with a big sting!” For each of those 5 years, this country has to find more than US$100 million extra; when “we cannot even find comfortably $80 m Belize dollars extra” today. She said that there is the need to discuss the structural reforms necessary to generate the money needed. He said that whereas he is happy that the Government is saving on interest payments with the renegotiation, the Government should have been using the 1% money gotten under the PetroCaribe arrangement with Venezuela to set up a sinking fund to retire the expensive superbond debt, as it had written in the law. He said that talk about kicking the can further down the road is admission that in 2030, Belize is not going to pay the debt but will renegotiate and refinance it. Lizarraga said that with the presentation of the new budget, the debt is at $3.15 billion and counting, with Government now passing legislation to borrow more. “Where is the cutting of the fat? Who is robbing from our grandchildren? Please…” Lizarraga retorted. In answer to Lizarraga’s question, PUP Senator Eamon Courtenay said: “because the bondholders demand it…” He also pointed to a side note in the motion which says that “cooperation with the IMF [International Monetary Fund] is required,” which he said are “code words for a stand-by agreement” with the IMF, which has routinely called for wage cuts and attrition of the public sector work force as measures to balance the national budget. “Talk about belt-tightening? It is belt-lashing that the bondholders put on them,” said Courtenay, challenging the legality of the enabling statutory instrument. The Senate meeting opened at around 10:00 a.m. on Monday and concluded at around 8:00 that night.